is the Principal Harpist with the Dallas Symphony Orchestra and Bronze Medal Winner of the 9th USA International Harp Competition. Her playing has been praised for its “communicative, emotionally intense expression” (Jerusalem Post) and the Herald Times commended her “technical wizardry and artistic intuition.” As a soloist, orchestral musician, and chamber collaborator, Levin brings the harp to the forefront of a diverse musical spectrum, using her instrument to connect with all audiences. Have harp will travel. 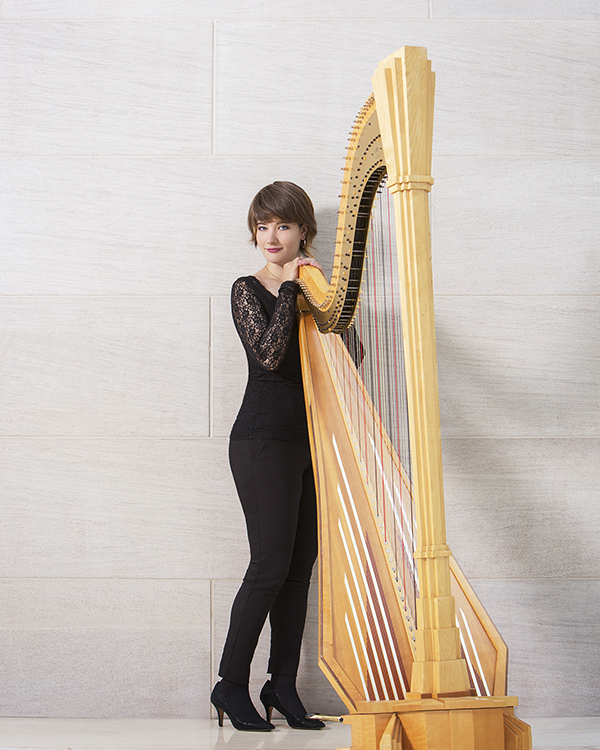 The youngest principal harpist of a major American orchestra, Levin has performed at Festspiele Mecklenburg-Vorpommern, the World Harp Congress, and with the Dallas, Jerusalem and Colorado Symphony Orchestras, the Louisiana Philharmonic, the Colorado Chamber Players, and the Indiana University Festival Orchestra, among others. She was a featured Guest Artist at the 2017 Lakes Area Music Festival, and has performed with the New York Philharmonic at David Geffen Hall and at the BRAVO! Vail Music Festival. As a soloist and chamber musician, she has performed throughout the United States and Europe, including at the Kimmel Center, Alice Tully Hall, and the Meyerson Symphony Center. She is a 2016 Winner of the Astral Artists national auditions, and a top prizewinner at the International Harp Contest in Israel. Levin is on Faculty at the Young Artist's Harp Seminar. A strong believer in music’s powerful impact, Levin organized a concert series in early 2017 with her fellow Dallas musicians, with all profits benefiting the International Rescue Committee and the Refugee Services of Texas. She is passionate about sharing music in schools, giving free masterclasses and interactive performances to students and young harpists. In the works . The 2017-2018 season brings Levin’s second season as Principal Harpist with the Dallas Symphony Orchestra, as well as over 30 solo and chamber performances throughout North America. With the Dallas Symphony Orchestra, Levin performs Mozart’s Flute and Harp Concerto under Jaap van Zweden, her second solo appearance with the orchestra in as many years. Other musical highlights include performances at National Sawdust, (Le) Poisson Rouge, the Lyric Chamber Society, Englewood Fine Arts, the University of Ottawa, and the Fine Arts Chamber Players. She is the Featured Artist for the 2018 Southwestern Music Festival, performing both a concerto and a chamber recital, and will be a Guest Artist at the 2018 Suzuki Association of the Americas Conference. In September 2017, Levin released her debut album, Something Borrowed, which explores the connection between music, literature, and culture. For the recording, the Classical Recording Foundation awarded her the 2017 Young Artist of the Year. In with the new . Levin works extensively with established and emerging composers alike, which led to commendation from the New York Times for both “singing well and playing beautifully.” She is a core member of the New York-based new music group Ensemble Échappé, and can be heard on the recordings of composers such as Charles Wuorinen, David Dzubay, and Louis Karchin. In 2012, The Indiana University Composition Department recognized her for her collaboration and performance of new music. Most recently, Levin commissioned a four-composer set of character pieces inspired by Shel Silverstein. Book learning . Levin received her Master of Music degree in 2015 at the Juilliard School under the tutelage of Nancy Allen, where she was a teaching fellow for both the Ear Training and Educational Outreach departments. A self-described bookworm, she completed undergraduate degrees in Music and History at Indiana University with Susann McDonald. Her honors history thesis discussed the impact of war songs on the French Revolution.